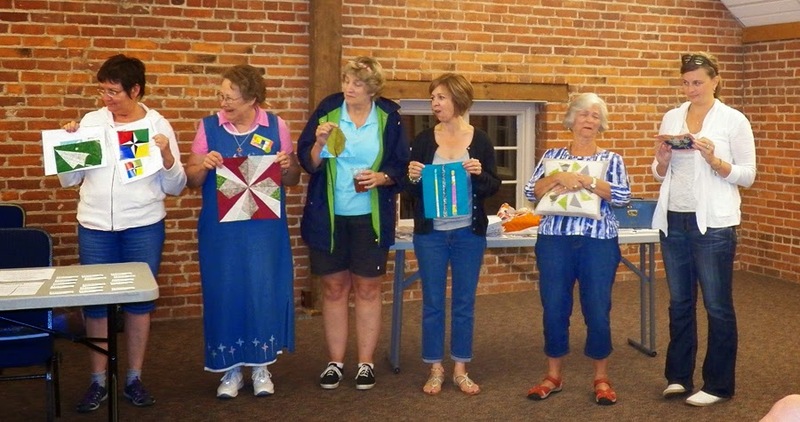 Quilt Show: Karen from the Centennial Barn invited our guild to present our quilts as part of a quilt show in February 2015. 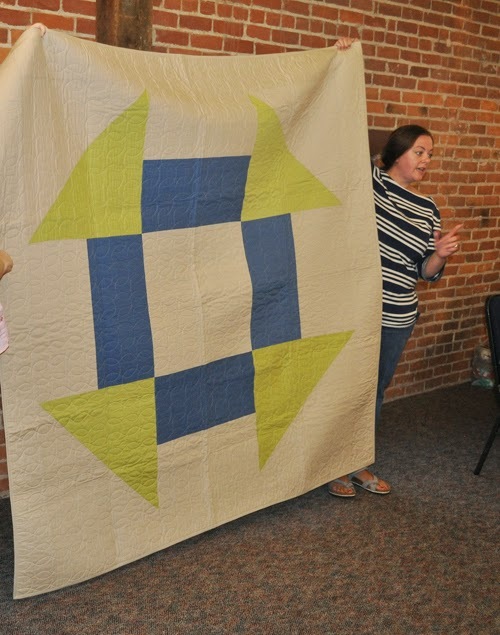 Discussion about possible "themed" quilts to be made as a guild and presented (ex, flying geese, modern take on traditional block, solids challenge). Member Cards: Member cards have arrived from the national Modern Quilt Guild. Pick yours up at the next meeting or contact Michelle with questions. Upcoming Sew-Ins: Mark your calendars for these sew-ins. 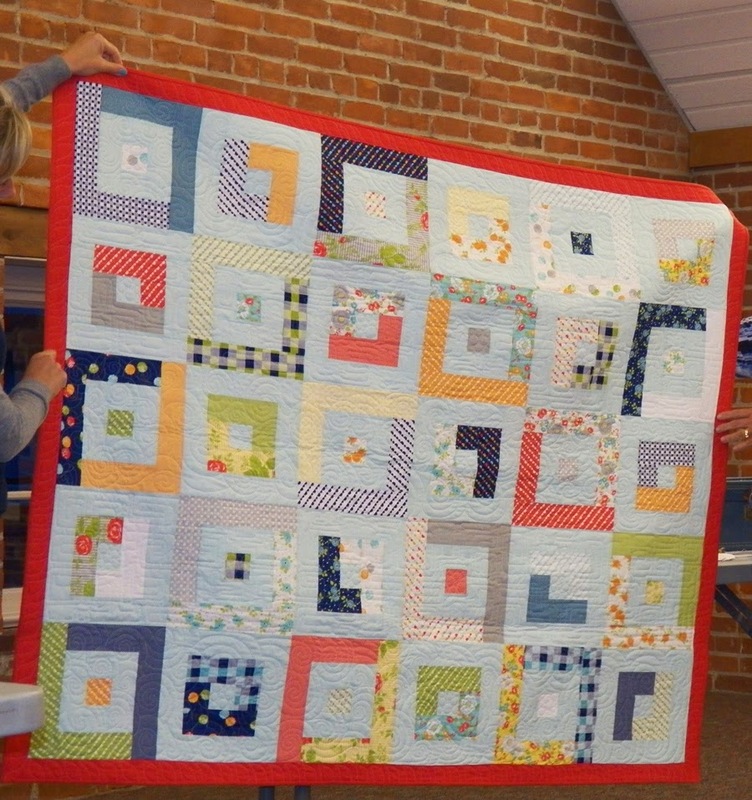 Bring a project of your own or help create a charity quilt top. 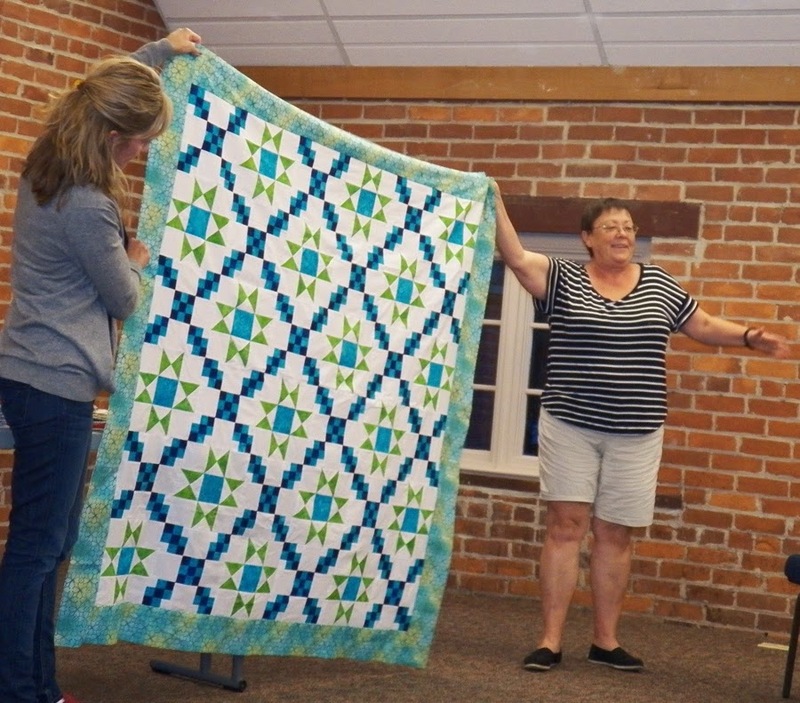 Charity: Ellen shared the charity quilts that were completed at the August sew-in by our members. 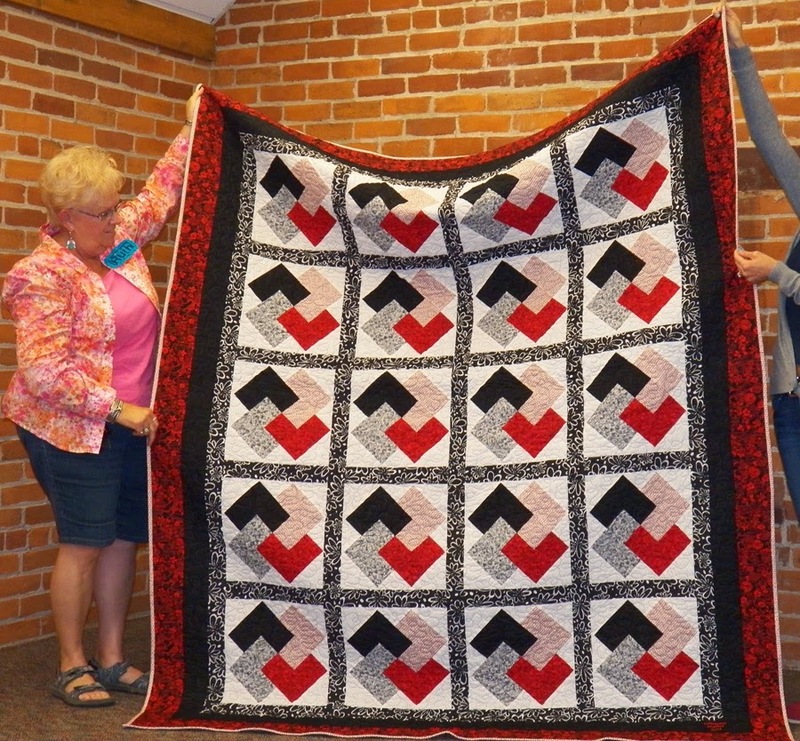 The quilts will be given to the VA (Veterans Association). Donated solids and prints from Robert Kaufman Fabrics were used. Members who participated: Christine, Ellen, Jill, Kayla, Amy, Kathy G., Annie, Lynn, Andie, Janice, Lesley, Carolyn, Carol, Teresa, and Sister Ann. Six quilt tops were completed and multiple quilt "kits" were cut and created for easy assembly next time. Ten yards of solid fabric have been donated for charity purposes, and we are going to be purchasing batting through retail stores at discount/clearance pricing or possible purchase of "seconds" from Hobbs Batting for deep discount. 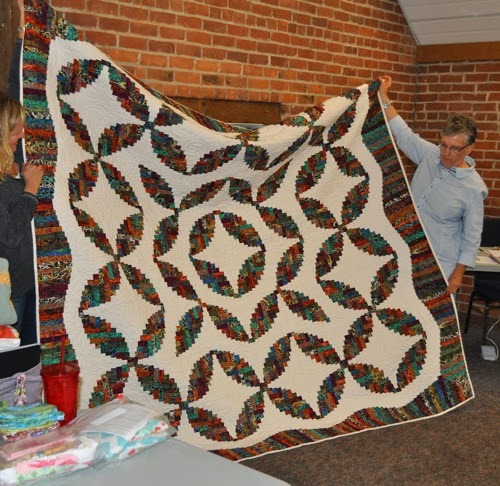 Members are encouraged to bring quilt tops to donate (full-sized quilts to be used on hospital bed; no lap sized needed), fabric to be used to create "kits," or donation of long arm services to finish quilts. 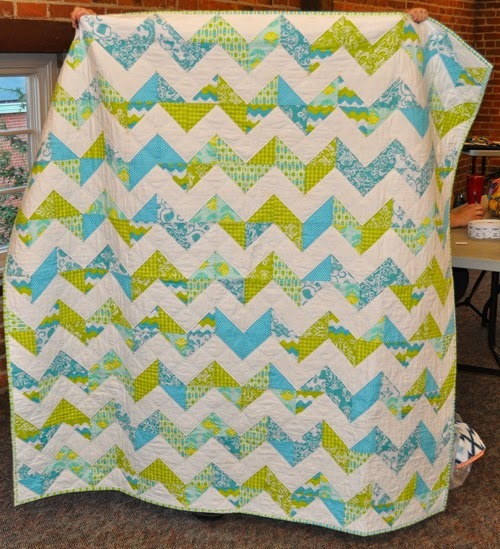 Here are the charity quilt tops we finished. 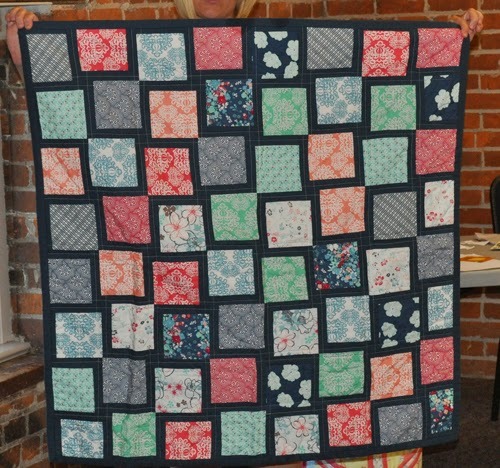 Sister Ann put together this quilt with pretty fabric squares. 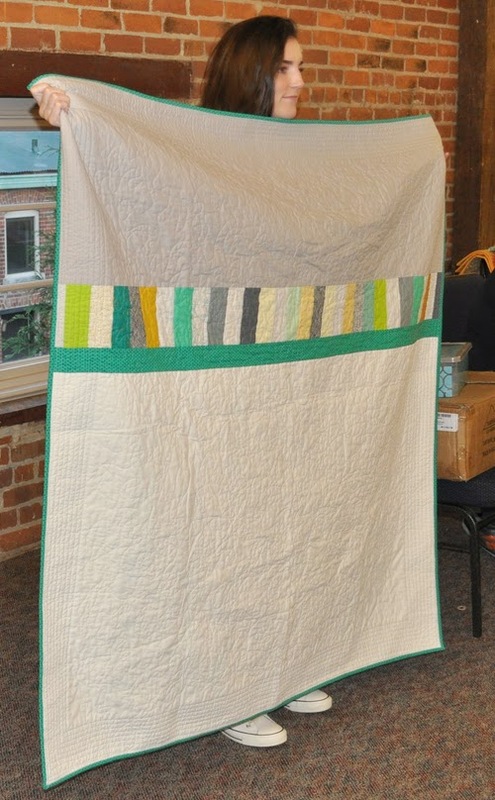 This quilt is made from the Road to Tennessee block and fabrics donated by Robert Kaufman. 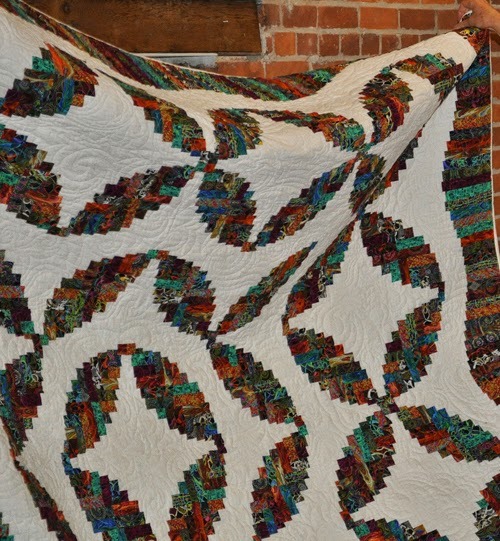 Janice and Leslie put together this Rail Fence quilt. 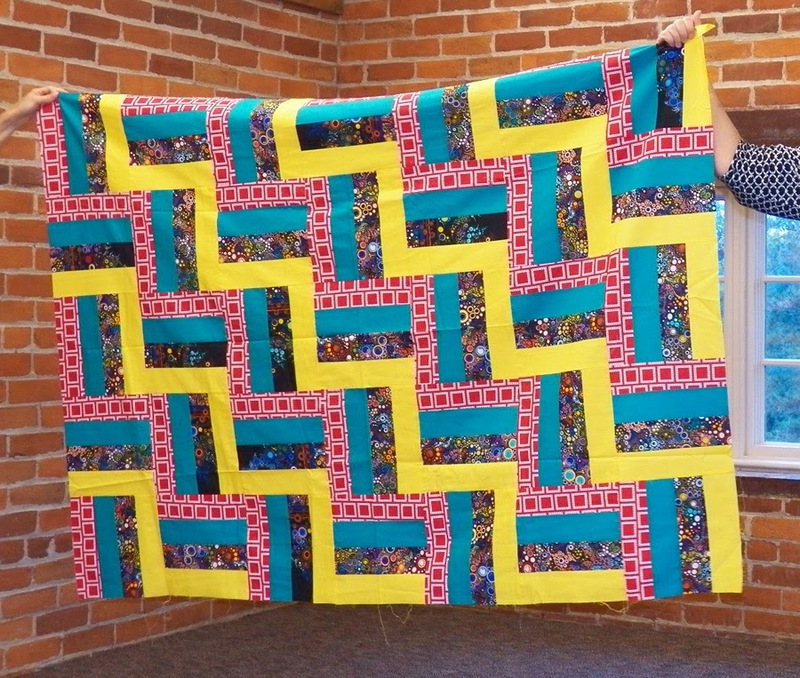 Sister Ann made this quilt top from blocks and fabrics donated by a guild member. 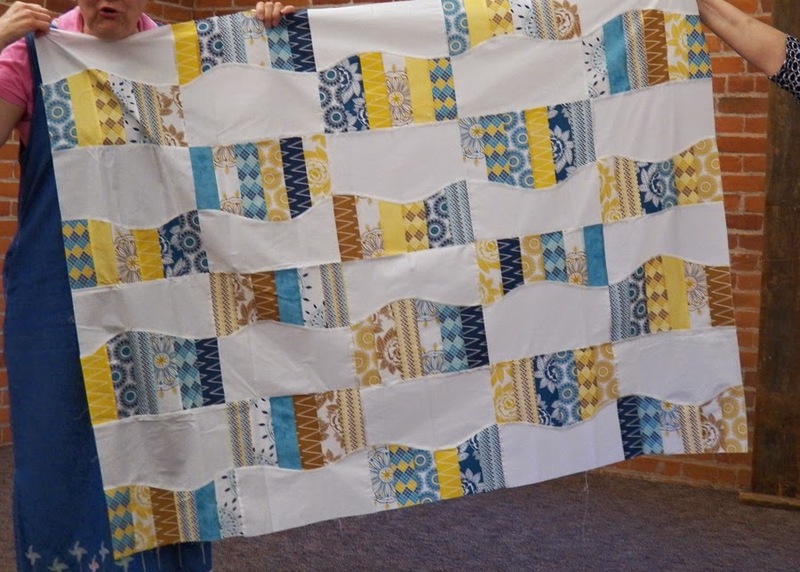 Annie and Kathy put together this Rail Fence block that uses Robert Kaufman fabrics. Sister Ann hand quilted this beauty. Sisters Annie and Abby worked on this quilt together. 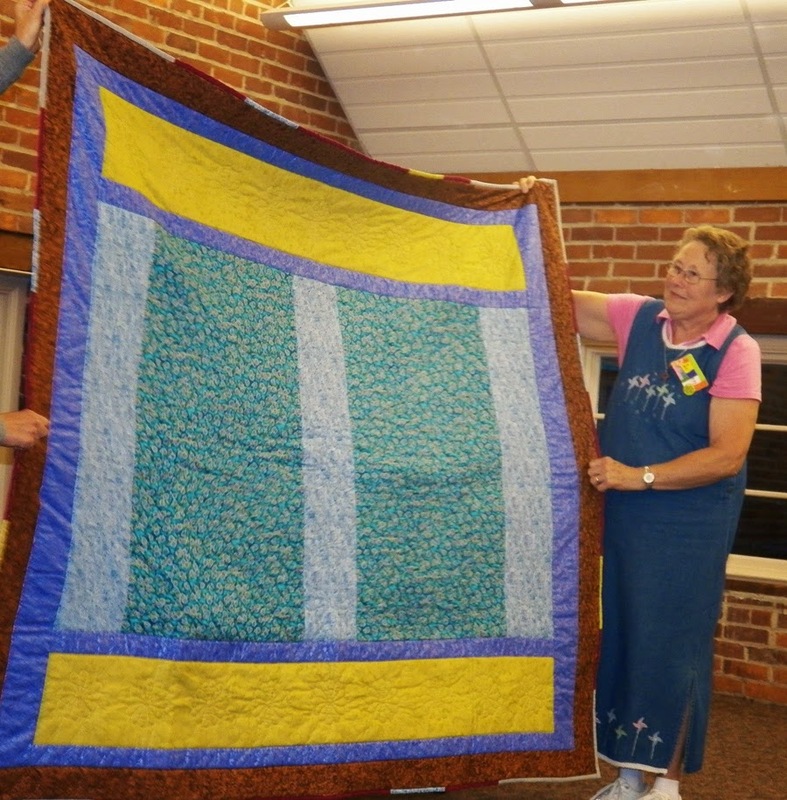 Kathy made this jelly roll quilt, which was quilted by Janine. 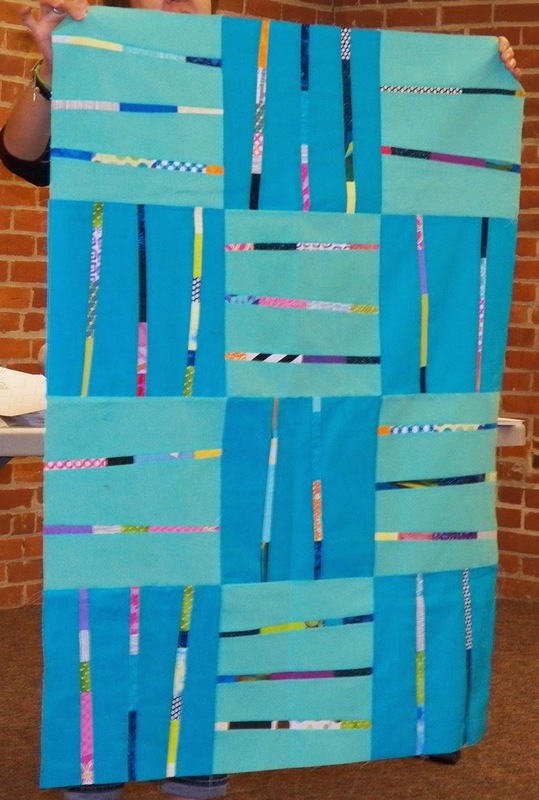 Janice made this matchstick quilt. 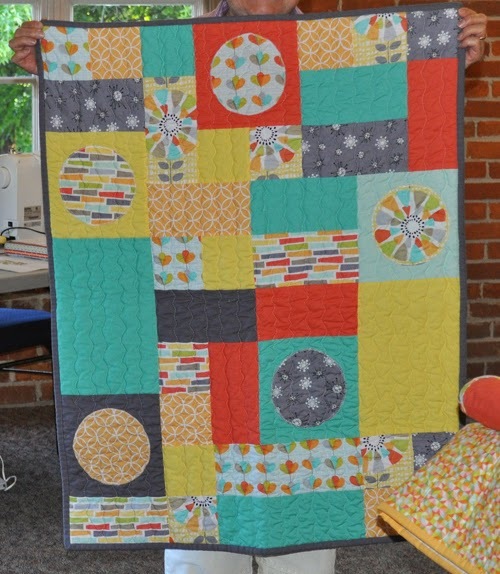 Karen made this lovely circle quilt for a friend. 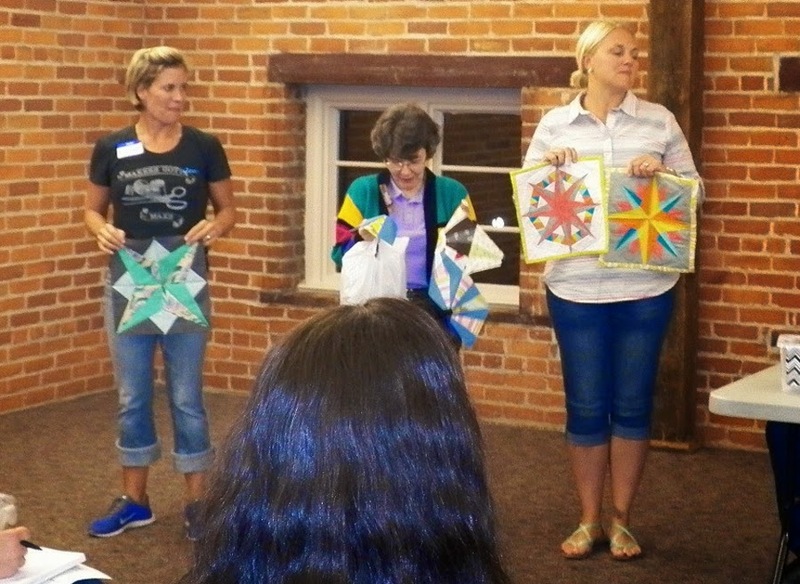 Paper Piecing: Last month's paper-piecing demonstration inspired these members to show off their paper-piecing skills. 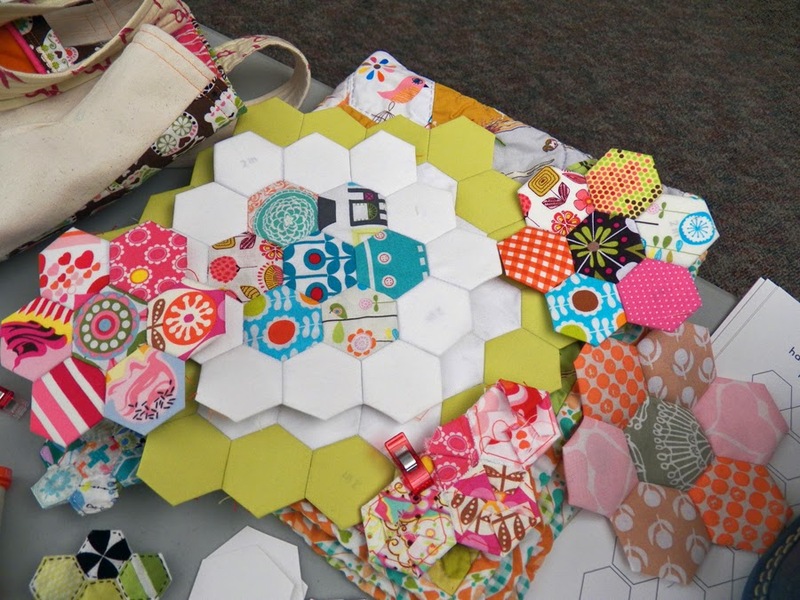 Wendy shared multiple projects she has created using hexagons shapes. 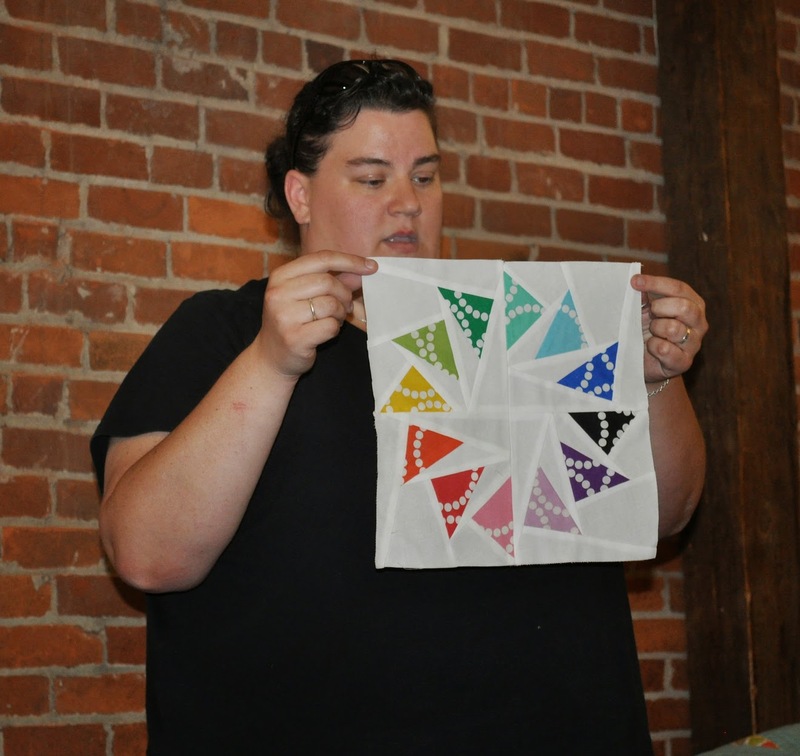 She demonstrated her "hexie’s by hand" method and then led everyone in a hands-on lesson creating our own hexies with a paper template and 3-inch squares. 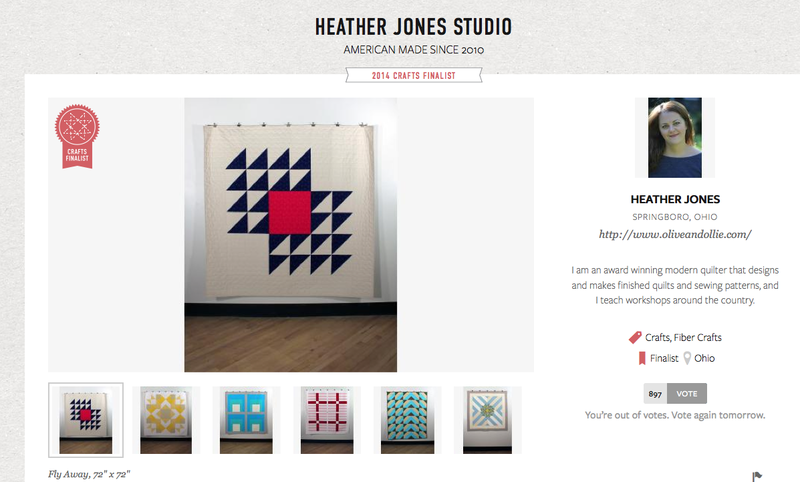 She has a variety of hexie sizes that can be downloaded from her website theprintedstitch.com for everyone to use. Great demonstration! The next meeting is Wednesday, October 8, 2014. 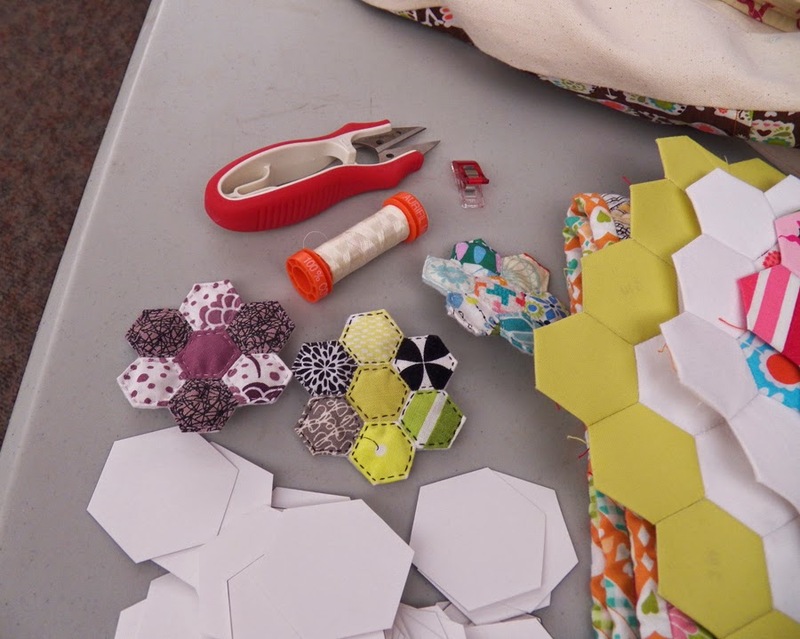 Create a name tag or take the Education challenge and create a handmade item using hexagons. See theprintedstitch.com for ideas and tutorials. MakerFaire: We have been accepted as exhibitors at the Cincinnati Mini MakerFaire to be held September 13 and 14 at Union Terminal. We will need volunteers to be at the booth for both days of the event. Once we find out how much space we will have, we'll make a plan as to what we'll display. 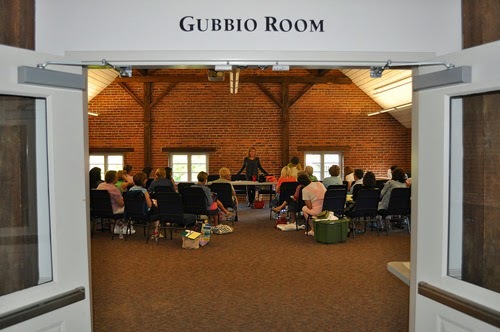 But for those volunteering, please bring small, modern, quilted items to show and talk about. You may also want to bring some handwork to do, as this will help engage people walking by. 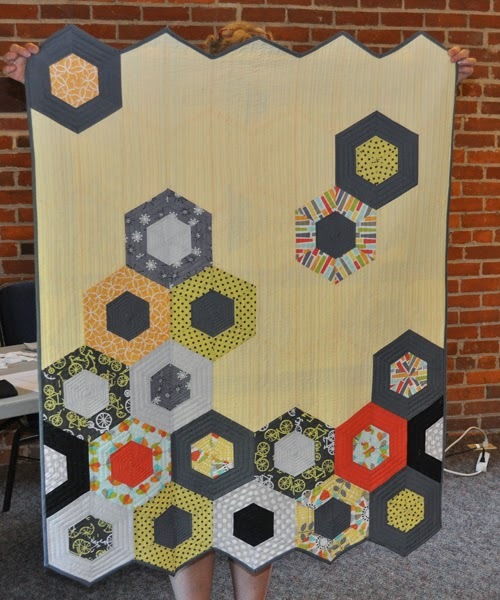 This may include sewing hexagons, sewing on a binding, or cutting out your next project. More information to come at the September 10 meeting. 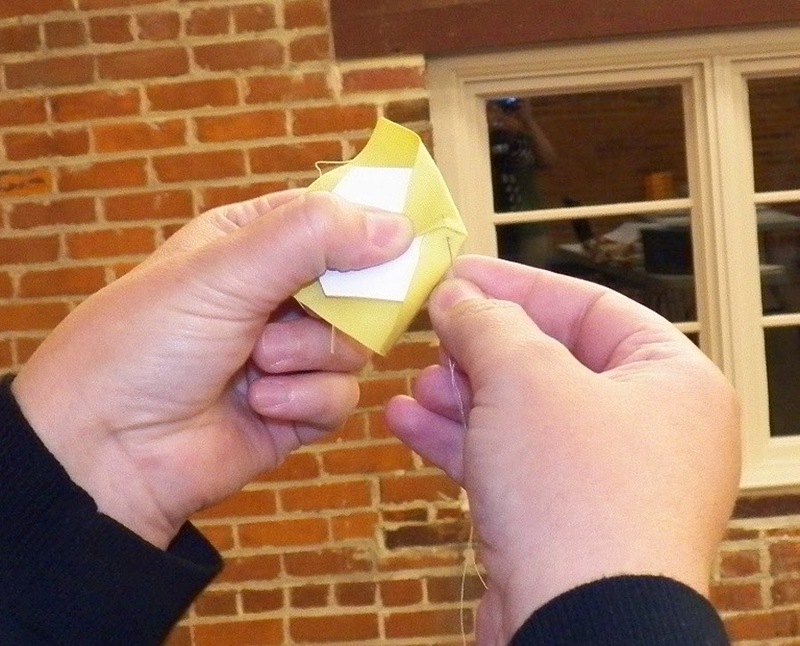 Click here to learn more about Cincinnati Mini MakerFaire. Charity Project Survey: We received about 12 responses to the charity project survey sent out to members in August. Everyone who responded wanted to keep our donations local, rather than national. And it was agreed that each charity drive would last about 3 months. 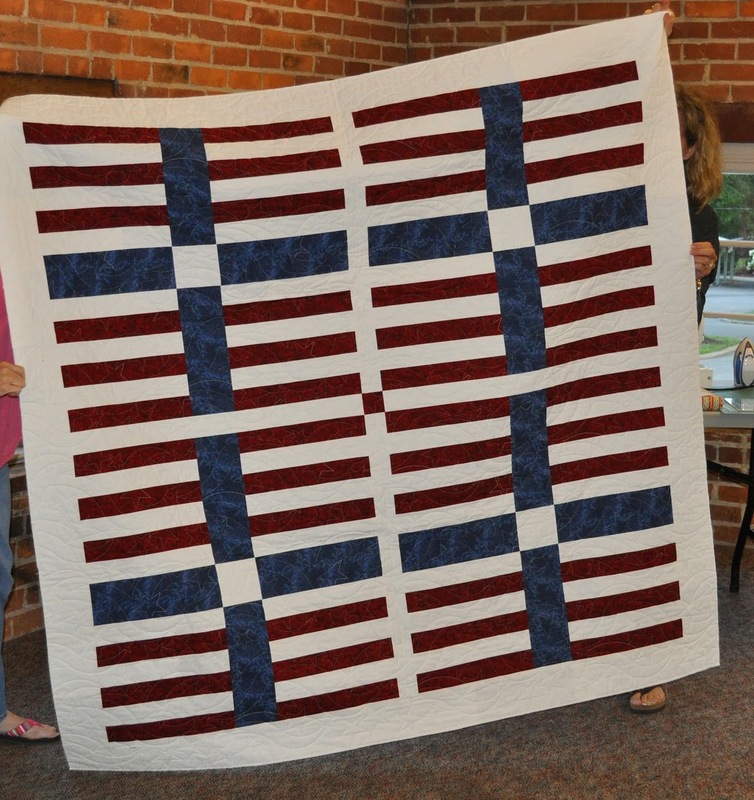 The first group for which we'll be making quilts is veterans in VA hospitals. Michelle has contacted a number of fabric and batting manufacturers about donating product for our charity projects. Robert Kaufman Fabrics has already sent fabric for us to use! And Hobbs batting contacted us about their program to sell batting "seconds" at a discounted price. 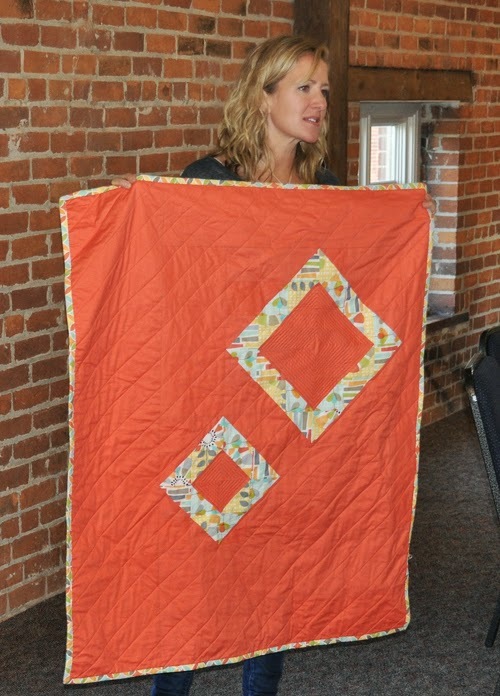 We'll also be looking into other discounts and partnerships to help offset the costs of making these quilts. 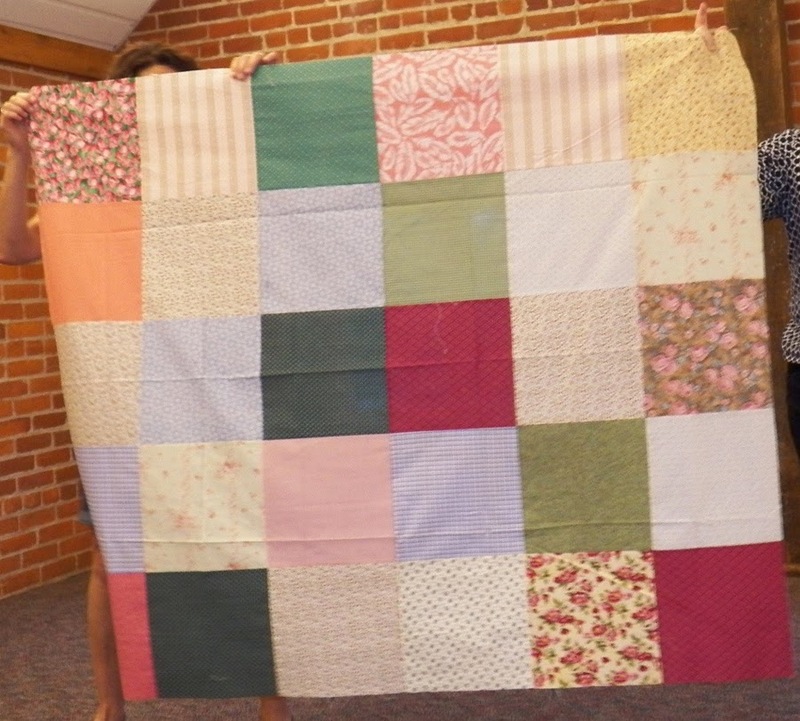 If you have fabric, orphan blocks, scraps, or other supplies to donate, please bring them to the next meeting. 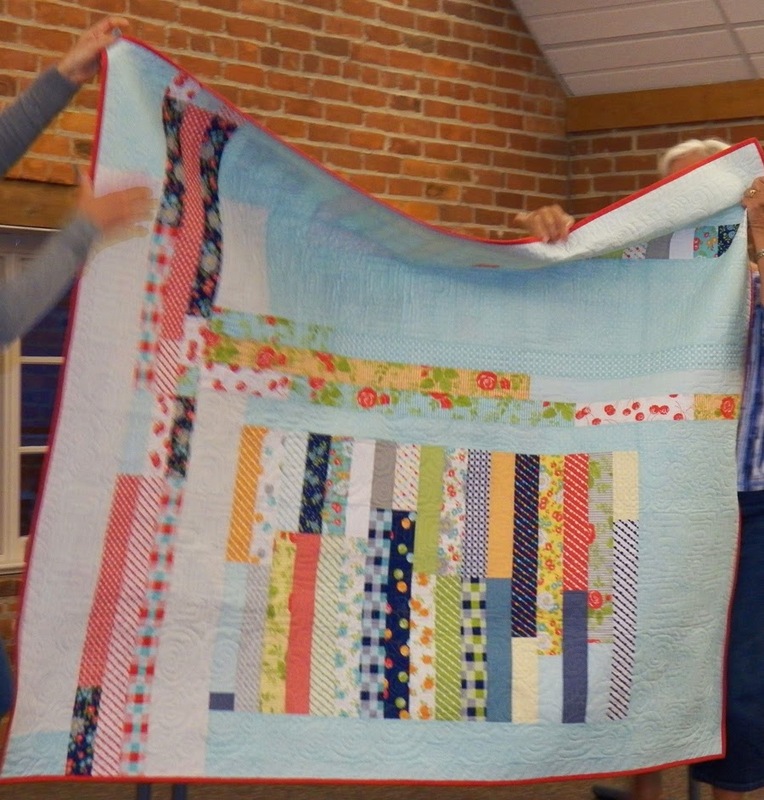 Project Linus Quilts: Ellen contacted the local Project Linus chapter to let them know that we'd be donating many of our Michael Miller challenge quilts to them, and they were thrilled! 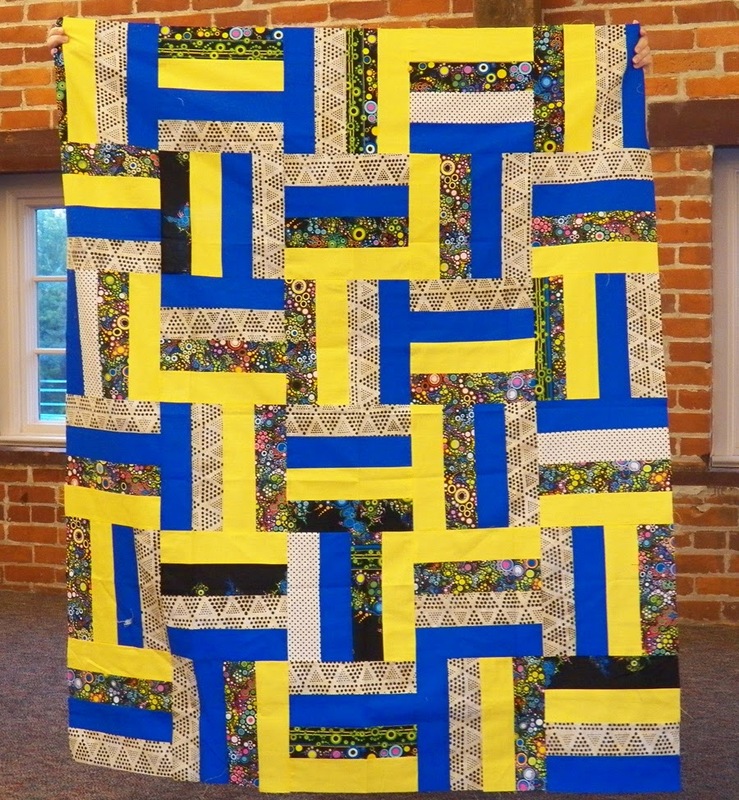 Harriet finished her challenge quilt and is looking forward to submitting it to upcoming quilt shows. 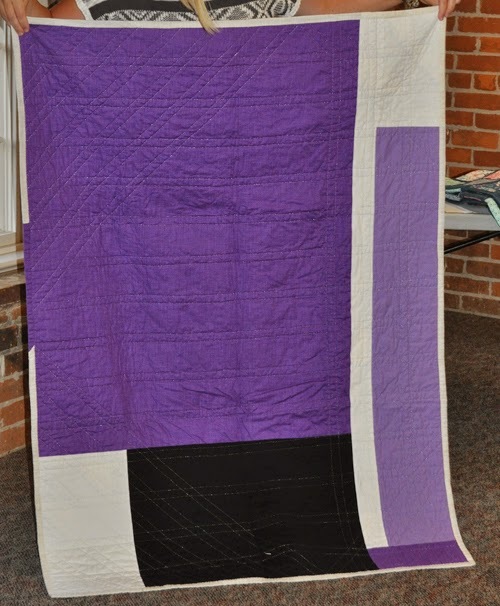 This is the first quilt Ellen free-motion quilted on her longarm. The backing fabric is from Ikea. 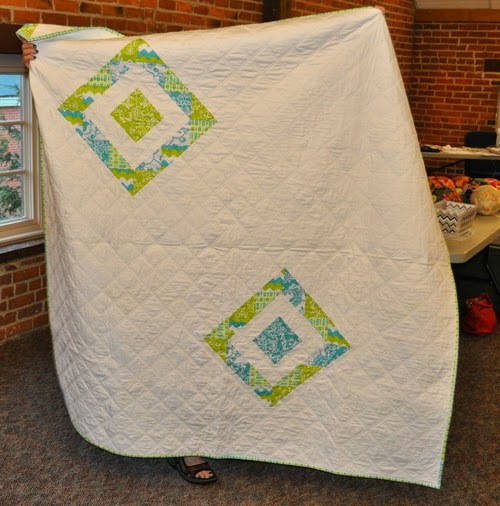 Carol liked the fabrics so much she didn't want to cut into them, so she designed this quilt keeping the pieces mostly whole. The backing fabric is from Michael Miller, too. 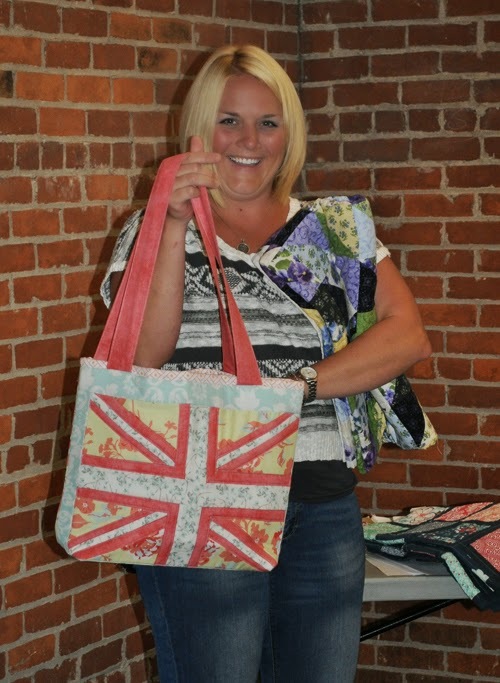 Michelle used the challenge fabrics to help sate her obsession with half-square triangles that make a square. Sister Ann finished her quilt with a pretty gray on the back. Sew-Ins: Mark your calendars for these upcoming CMQG sew-ins. Each will be held from 10am to 5pm. New Local Businesses: Two new businesses of interest have opened! Cincinnati Sew and Vac: 3156 Linwood Ave in Mount Lookout. The owner is focusing on servicing machines, but there will be some for sale, too. All brands are welcome for servicing. Weekend Quilts: 125 Walnut Street, Lawrenceburg, Indiana. 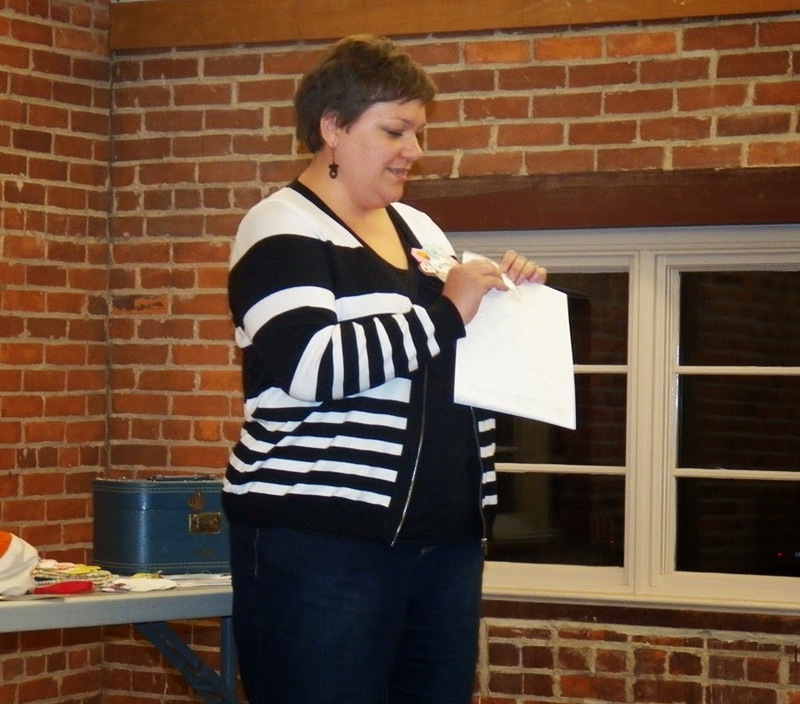 Owner Karla Tankersley attended the meeting to tell us about her new modern quilt store. 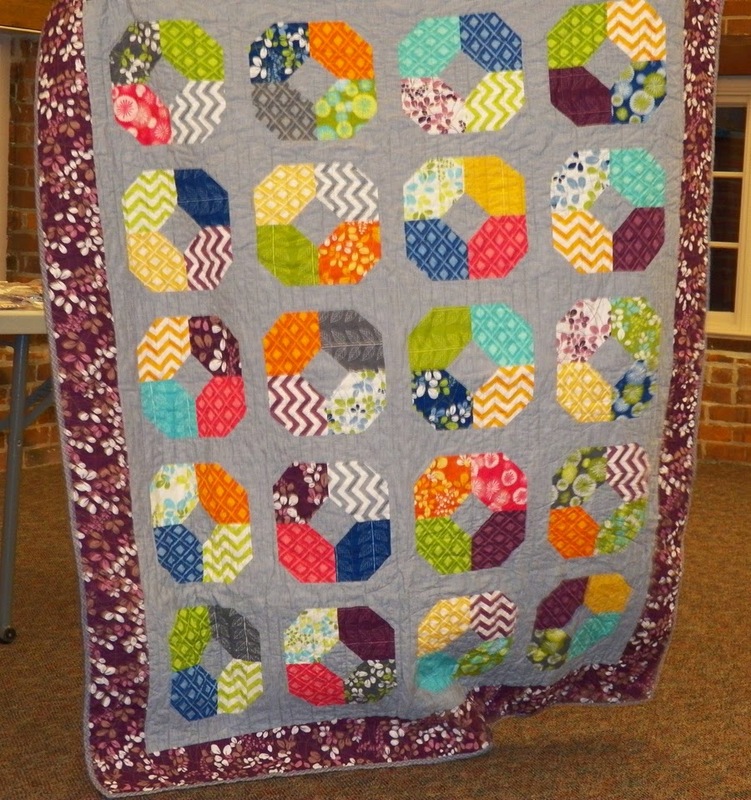 In addition to fabrics, she'll be selling items for the quilter's lifestyle, including quilt-themed or quilt-inspired apparel, jewelry, and home decor items. She'll also be offering many unique classes. 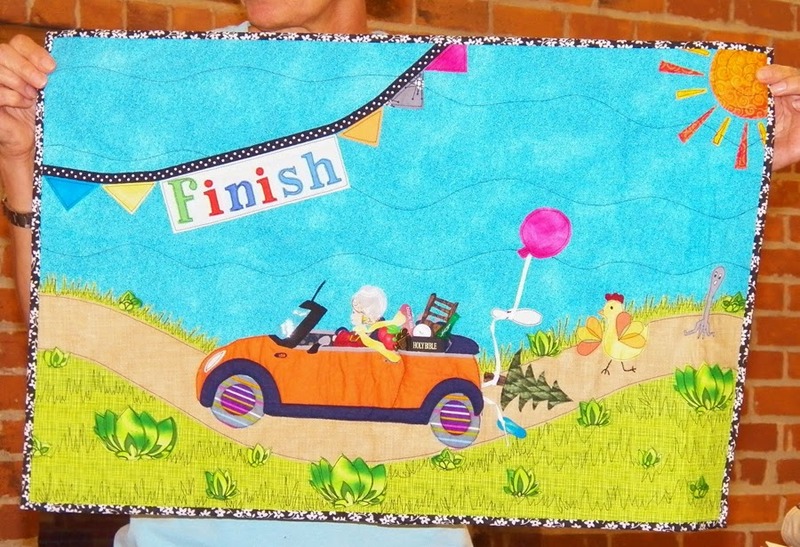 Click here to check out Weekend Quilts' Facebook page. Flickr: Would you like to see the photos in our monthly blog posts larger? Then join our Flickr group! Click here to check out the CMQG Flickr group. 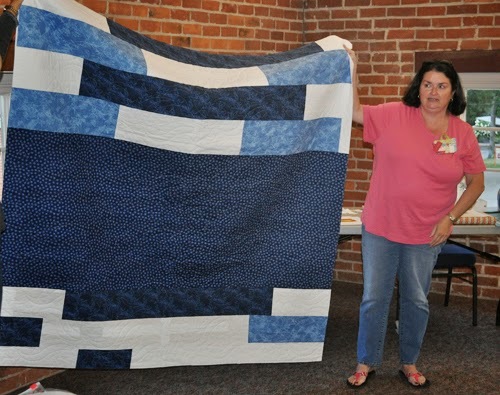 Sheila created this quilt for her nephew, a Captain America fan, using Heather Jones' You Plus Me pattern. Sheila plans to bind it with white fabric. 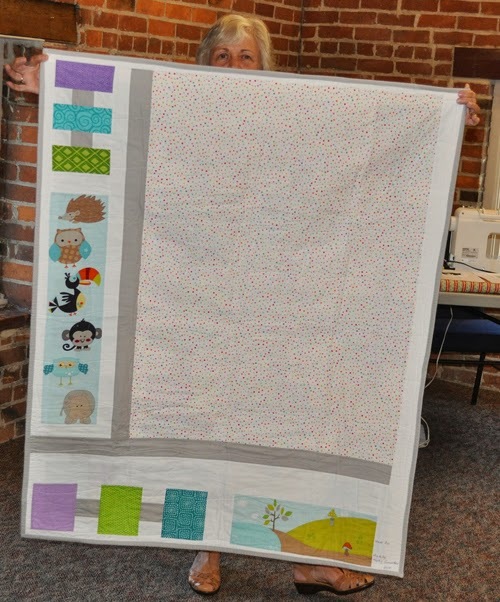 Kathy made this quilt for her nephew who is expecting his first child. The child's room has a jungle theme, so Kathy used a cute panel fabric. 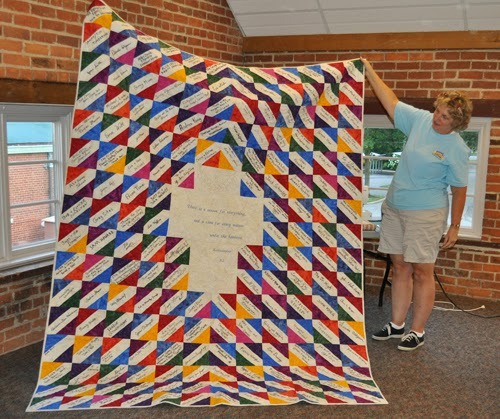 Harriet made this signature quilt for her pastor who is leaving. 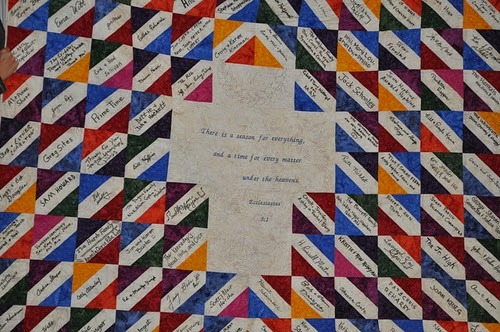 The quilt has 176 signatures, and the Bible verse in the center is the pastor's favorite. 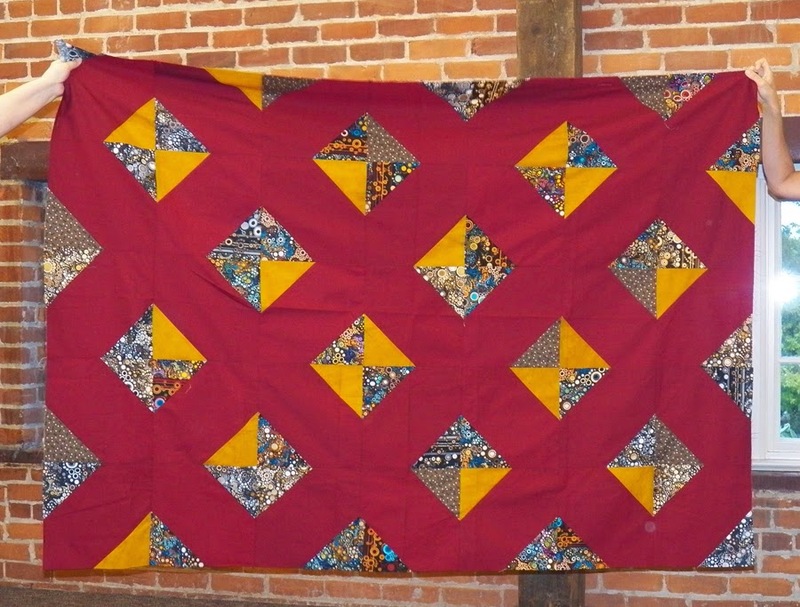 Sandy made this Buckeye quilt with rich, gorgeous fabrics. 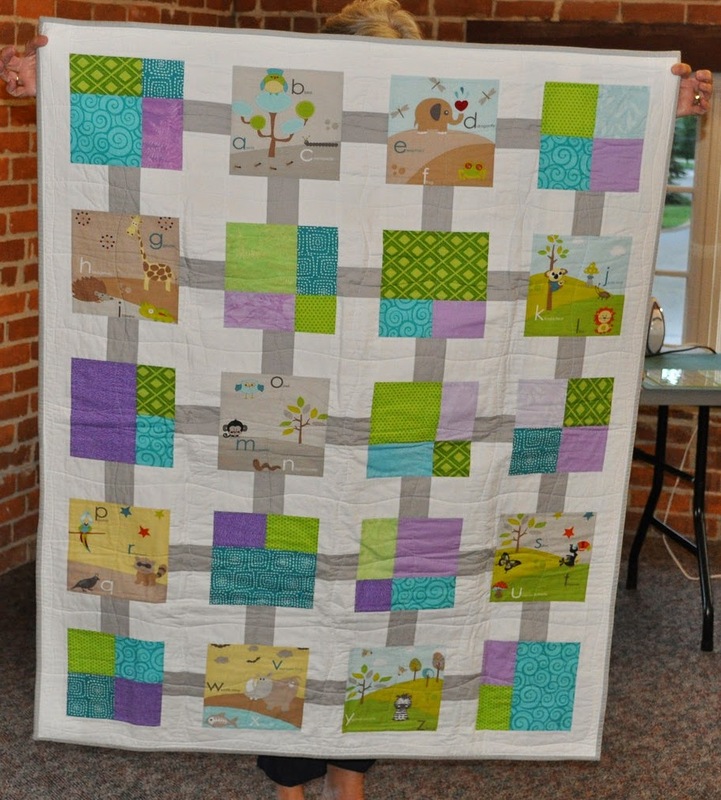 Annie made this quilt to enter in a charm pack contest. She finished the day of the meeting (but didn't meet the deadline for the contest). Another project Annie finished up recently. 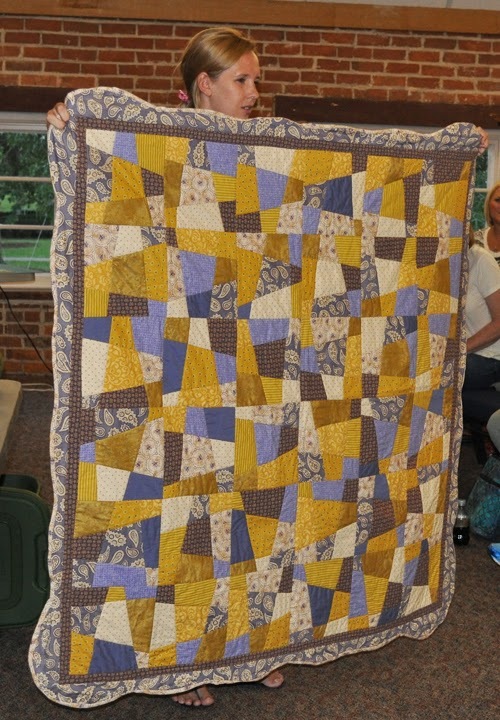 Annie started this quilt a year ago and finished it the day of the meeting, too. 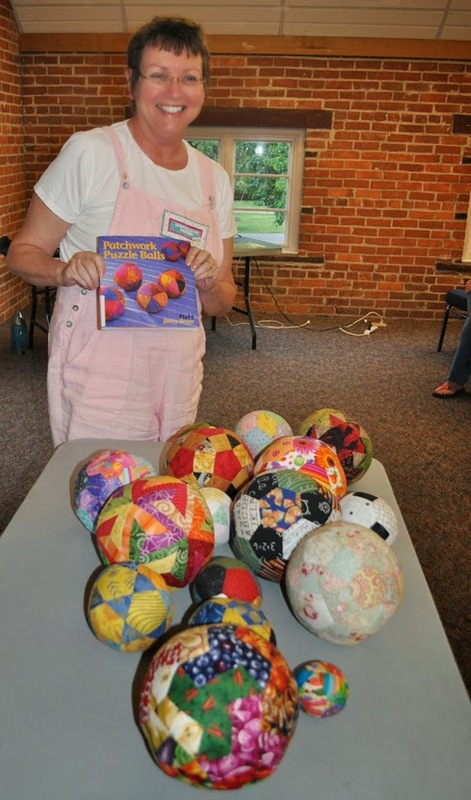 Cass made each of the balls from Patchwork Puzzle Balls by Jinny Beyer. 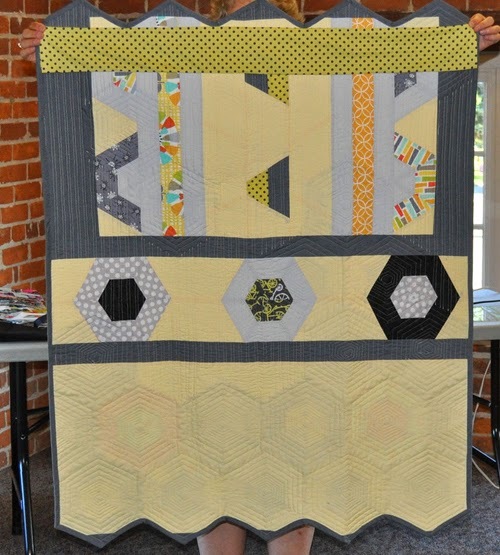 Each ball uses scraps from a different quilt Cass has made. The balls are all hand-pieced and took a bit of thought, but Cass says they were fun to make. 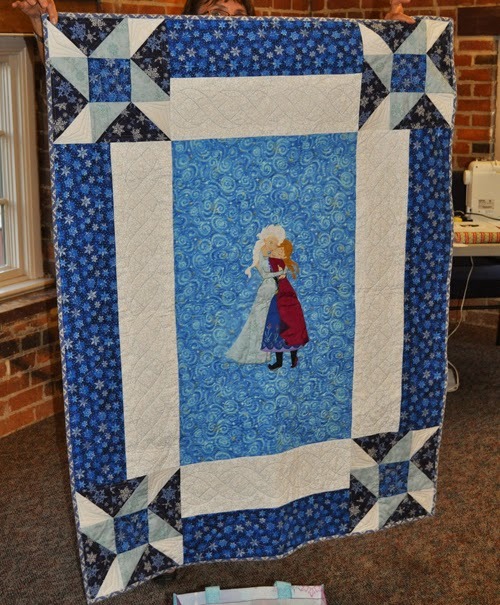 Carole made this baby quilt for her granddaughter. The theme is the movie Frozen. Carole appliqued the figures and painted their faces. This is first quilt Kay has made! 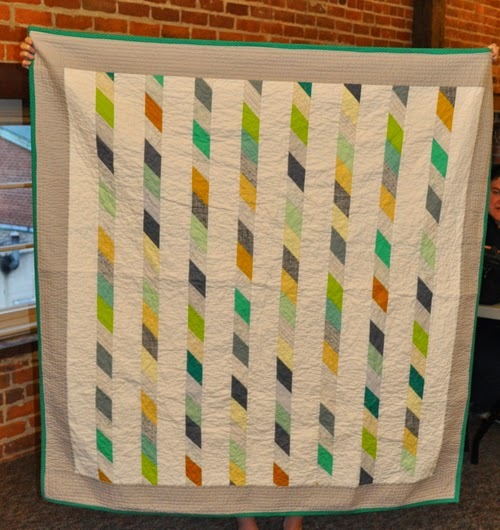 She thought she was making a green and navy quilt, but she learned that a little orange goes a long way. Kay brought her second quilt to show, too. 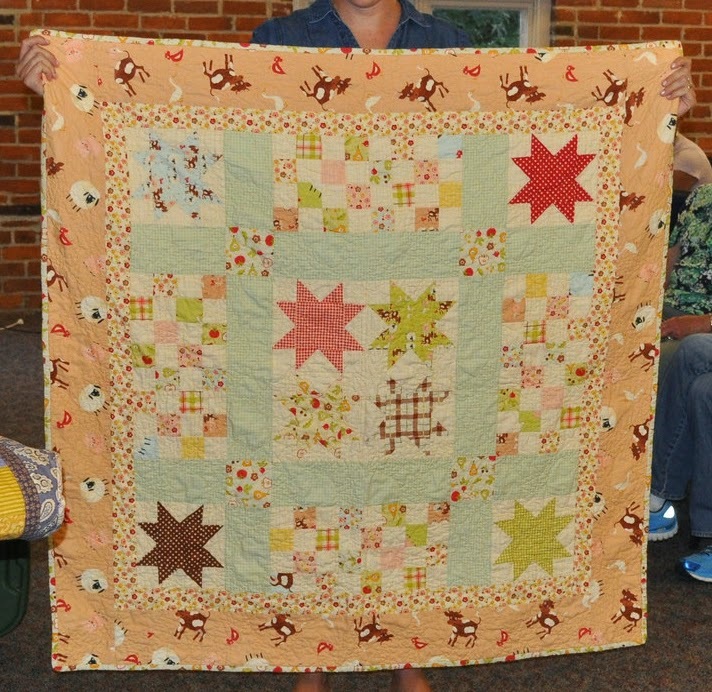 Lauren make this baby quilt for her baby, who also attended the meeting. The quilting is little sheep. 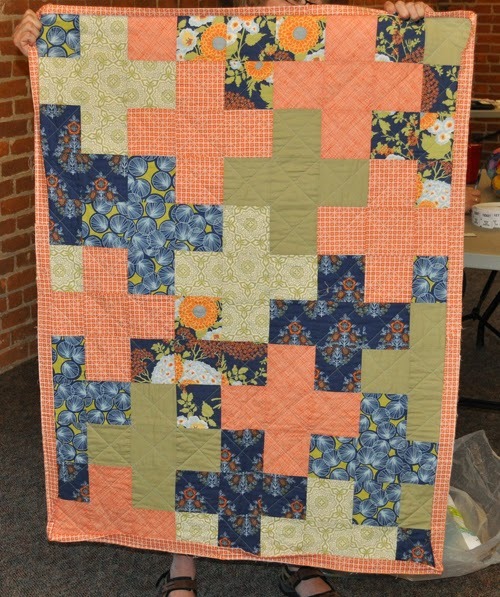 Lauren also showed this stack and whack quilt; this is the first time she did a scalloped binding. 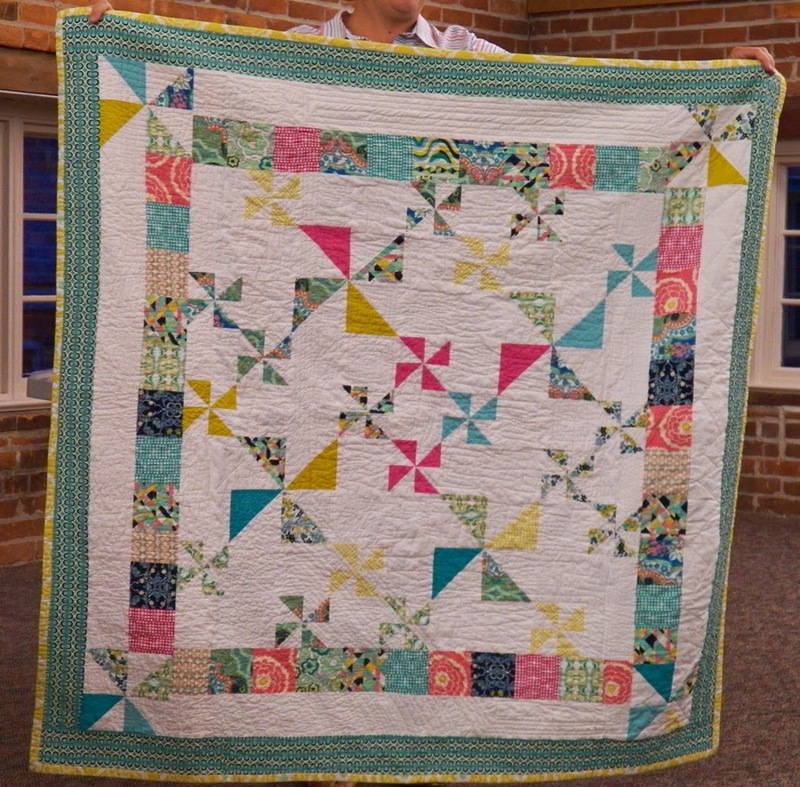 This quilt by Heather is featured in the September/October issue of Quiltmaker magazine. 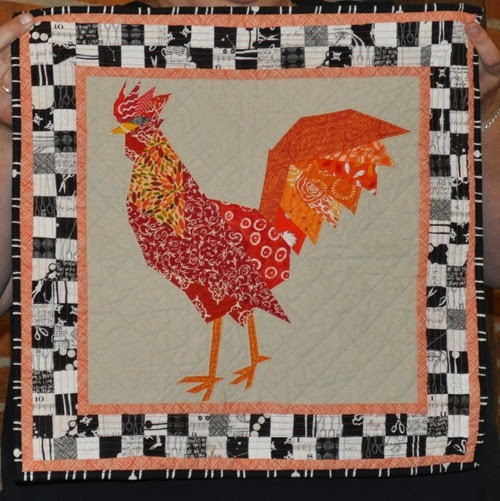 Angela Walters did the quilting; the only guidelines Heather gave her was to include quilted feathers. 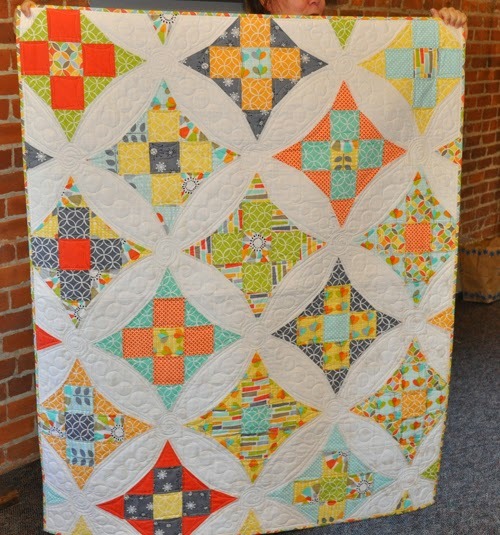 Heather also has a quilt in Lucky Spool's Essential Guide to Modern Quilt Making. 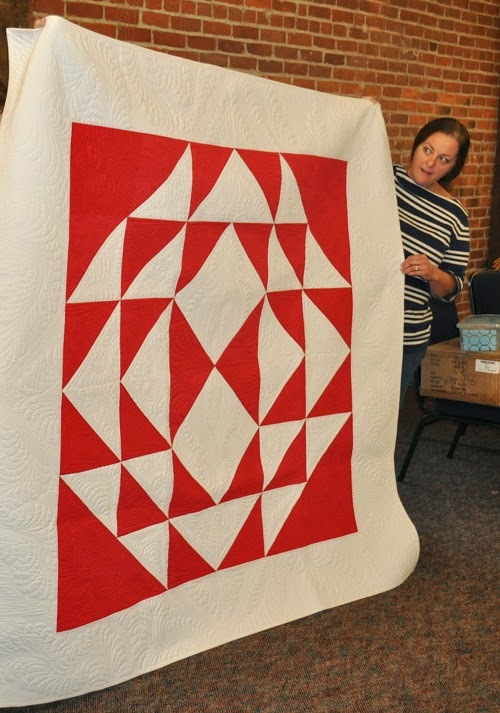 Heather's chapter is on large-scale piecing, and she created this large Churn Dash quilt. 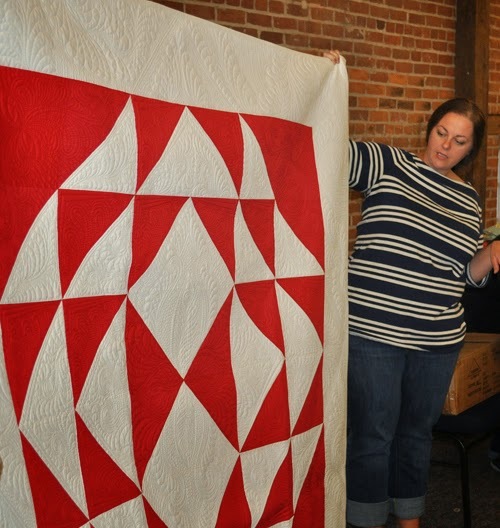 Our own Jill Montgomery did the quilting. 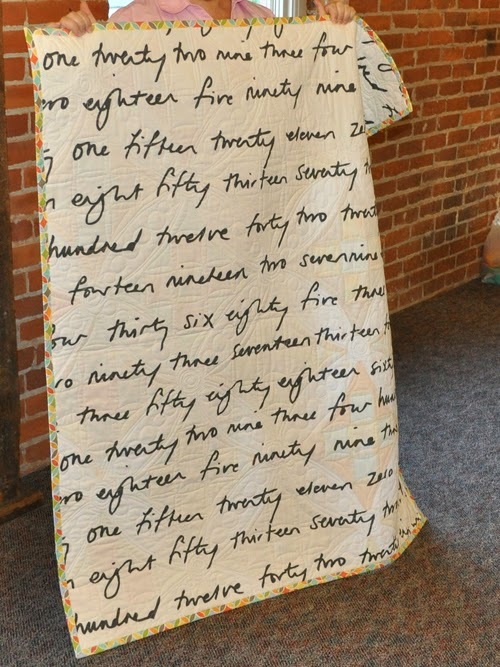 Teresa's daughter Molly made this, her first quilt. She even did her own free-motion quilting on it. 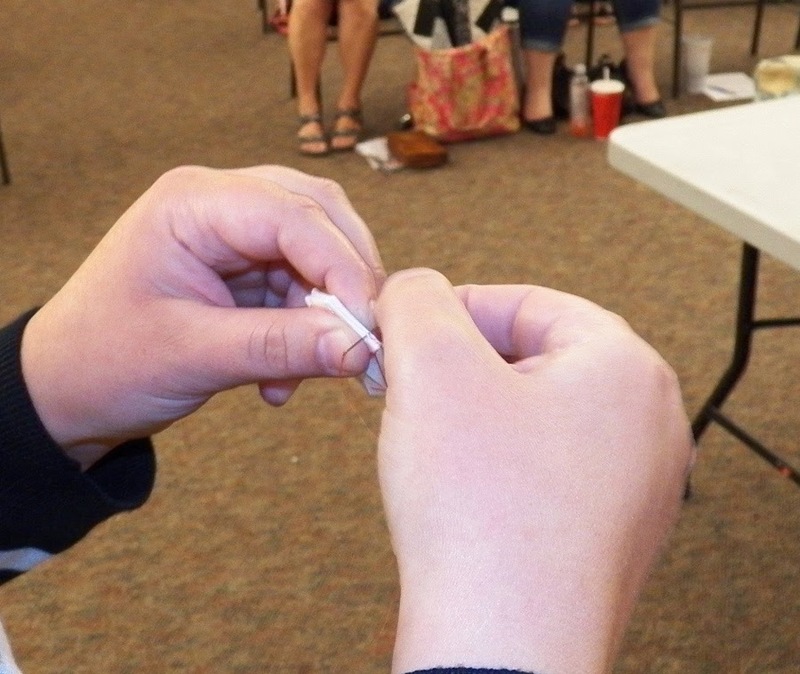 Brook and Gillian shared their paper-piecing tips and techniques at the meeting. They demonstrated simple and slightly more advanced patterns. Circle of Geese paper-piecing pattern. Brooke showed this piece to demonstrate how intricate and stunning paper-piecing can be.